Infantino has consistently been banging the drum about using football as a tool for improved political relations but a survey conducted by AFP suggests the opposite might be the case. A decision on co-hosting, possibly with Oman and Kuwait, is being delayed until the FIFA Congress in June but with Saudi Arabia, the United Arab Emirates and Bahrain continuing their diplomatic blockade of Qatar, such a scenario could further inflame tensions says the survey. 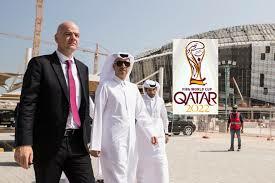 “There is a very real risk that expanding the World Cup to include Kuwait and Oman would make these two countries vulnerable to the same sort of regional pressure Qatar has faced since 2017,” said Kristian Coates Ulrichsen, a research fellow at Rice University quoted by AFP.